What to Do If I Get Into An Accident While Ride Sharing in Portland? If you get into an accident while ride sharing, you have a potentially complicated legal situation on your hands. As a passenger, you weren’t responsible for causing the accident since you were dependent upon the driver to keep you safe. However, you need to know who exactly is responsible for causing the collision, as you should be able to pursue a case for compensation to recover for any losses. If you get into a car accident while using a ride sharing service, you should contact an attorney right away. You should talk to a lawyer as soon as practical so you can protect and preserve your rights and begin the injury claims process. One of the most important things your lawyer will do is help you to determine who was at fault for the ride sharing accident. This could be the driver of the vehicle in which you were riding. Many people who drive for ride sharing services have to work long shifts. Some drivers will even drive for multiple different ride sharing services because this allows them to get in more hours. This can lead to situations where drivers are fatigued and suffer from delayed reactions and impaired judgment. Since Uber and other ride sharing providers communicate with drivers via their smartphones, there is also a big risk that a ride-sharing driver will be paying attention to their phone and not the road. These and other dangerous behaviors can lead to drivers causing crashes. Your lawyer can help you to obtain police reports from the crash and other evidence which shows who actually was to blame for causing the collision to happen. If the evidence shows the driver of the ride sharing service was the one responsible, your attorney can help you to decide who to actually pursue your case for compensation against. Most ride sharing services provide insurance. For example, Uber has provided up to a million per accident in liability coverage since 2013. Pursuing a case against the company facilitating ride sharing can make it possible to recover broader compensation. Your attorney can deal with the insurer for the ride sharing company on your behalf. These insurers handle accident claims all the time, they know the ins-and-outs of settlement negotiations, and they often try to pay less than claims are worth. Your attorney can help to make sure this does not happen with your claim and that you get the compensation you deserve. If the evidence shows another motorist was responsible for causing the accident, your attorney can also assist you in pursuing a case against that other driver. 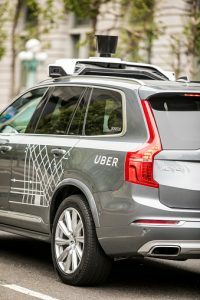 Whether you are making a claim against Uber, the ride-sharing driver of the vehicle you were in, or another motorist, your lawyer can help you to resolve your case inside or outside of court for the maximum about of compensation possible to cover your losses.